Luxury and affordable Studio apartment with a great location just 5 blocks away from the subway and a few metres from the very well known Alto Palermo Shopping Center. This Studio has been exquisitly decorated with a great taste. 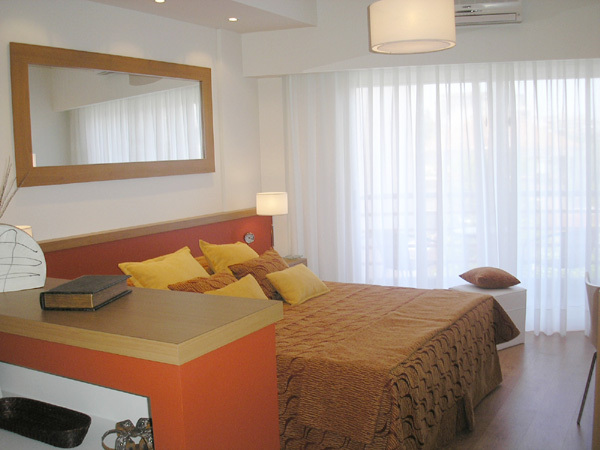 It offers a balcony with table and chairs, bedroom area with a queen size bed ( or two single beds). Dinning area with a glass table with chairs. Open plan kitchen fully equipped and a complete bathroom with bathtub and shower. Aircon. Heating system. TV with cable. DVD. CD Player. Internet High Speed. Wi Fi. Landline telephone. Safe box. Iron. Hair dryer. Kitchen with refrigerator, freezer, microwave, toaster, coffe-maker. Gas range. Gas oven. Dishes. Kitchen utensils. Bed linen and towels. Cleaning service once a week. Brand new building with a swimming pool ( for summer season), Barbeque area, Gym and Laundry. Two elevators. Included: Electricity, Gas, Water, Building and City taxes, Telephone for local calls.